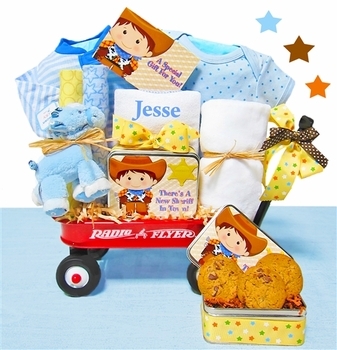 Throw a rope around our newborn baby cowboy wagon featuring three super soft baby blankets, a personalized cotton bib and a your personal ribbon message all included! This adorable wagon features both fun and practical items for the new arrival. The little man will surely be the talk of the town as he is seen in these cute products.